Yesterday we discussed the myth of Barbareek aka Khatu Shyam Baba. There are some small aspects of the same which are also quite interesting. Let us go through them. One small aspect of the myth is that post the battle of Kurukshetra, the Pandavas started arguing amongst them as to who was responsible for the victory. After much argument, Krishna, suggested that they ask the head of Barbareek as he had had a ring-side view of the entire battle. On asking, Barbareek said that it was Lord Krishna who was responsible for the victory as during the entire battle his game-plan and his suggestions were crucial to the outcome of the whole battle. From the height of the hilltop, all he could see was Lord Krishna’s sudarshan-chakra simply killing all the enemies and Draupadi in the form of Ma Kali simply lapping up the blood of all the enemies, not allowing a single drop to fall on the ground. To dig deeper in this aspect, one can see two very strong suggestions. One is the supremacy of Lord Krishna and the other is the prevalence of the cult of Mother Goddess. It is said that the practice of offering a sacrifice before the battle was to appease Ma Kali, who has always been associated with sacrifices and such aspects. Finally, this also has traces of the myth of Raktabija (http://utkarshspeak.blogspot.in/2011/11/raktabija-demon.html ) where Goddess Kali does not allow the drop of the demon to fall on the ground to avoid the multiplication of the demon from the drops of his blood. In oral tradition of mythology, such mixing up of myths is only human, is one guess. The other could be a harmonious co-existence of different cults at a given time. We have read earlier that when Krishna disguised as a Brahmin tested Barbareek’s power of the arrows, the arrow hovered around his foot, which had hidden a leaf. Another version says that the arrow actually pierced his foot and had made it a vulnerable zone. Another version says that Lord Krishna had got a boon from Sage Durvasa (the sage known more for his curses than boons!) that his entire body would be immune to weapons except his foot. Later we have read about the death of Lord Krishna by being struck by an arrow of a hunter in his foot which he had mistaken to be the face of a deer. This aspect of the myth is similar to the famous Greek myth of Achilles and his vulnerable spot, his heel. Achilles was a brave hero in the Greek mythology who was invincible except for his vulnerable spot, his heel. He meets his end, by being struck by a poisonous arrow in his heel. Quite a few similarities, I guess! Finally the justification of Lord Krishna asking for the sacrifice! According to one version, once Lord Brahma and other gods approached Lord Vishnu to complain to him about the evil on earth and how wickedness was all over and innocent people were not being allowed to live in peace. They urged Lord Vishnu to do something to eradicate this evil. Hearing this, a Yaksha spoke out of turn and said that for these kind of acts, he himself was enough and it did not quite require the help of Lord Vishnu. Lord Brahma was insulted at his impudence and cursed him that whenever he reached a stage of eliminating all evil on earth, Lord Vishnu would end up killing him first. Barbareek was the same Yaksha in the later birth and Krishna was only doing what was pre-destined! This is an interesting aspect of myth-making. On the face of it, it seemed that Lord Krishna had been unfair to a brave hero and got him eliminated. 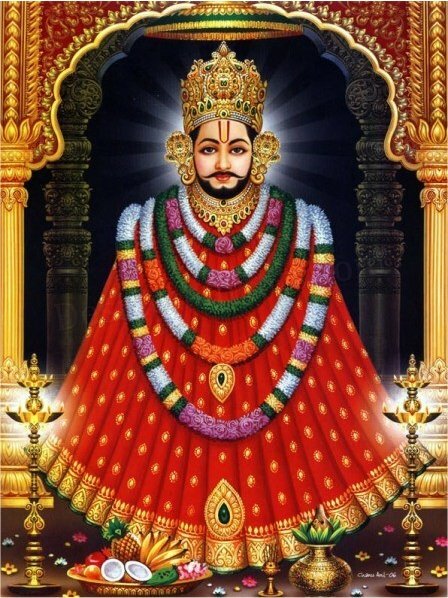 He would have supported the Pandavas and would ensure the victory of the Pandavas. Some skeptics would say that Krishna did so to avoid all credit going to Barbareek if it so happened and thus got him eliminated, even when he was related to the Pandavas and was going to fight from their right side. Some of these thoughts are of modern-day thinking. Epics are never like a once-written novel, where all instances are sequential. In the oral tradition, many aspects get inserted based on the orator, his preference and his biases as well as that of his audience. It is highly probable that this aspect of the Yaksha has been an afterthought when the hero of the story (Lord Krishna) begins to be misunderstood especially for his seeking the head of Barbareek. This could be an individual’s perception or a common notion. This aspect also highlights the process or the rationale of myth-making. Next time we will read about a similar myth, prevalent in South India. Every time I visit Delhi, I seem to get introduced to some aspect of mythology. Last time I came across a temple of Maharaja Agrasen(http://utkarshspeak.blogspot.in/2011/10/maharaja-agrasen.html ). During my recent visit, I was introduced to another very important deity by the name of Khatu Shyam Baba. Spoke to some and read a bit and the following are the details of the same and the details are quite interesting and intriguing. As they say, let’s start at the very beginning. The myth is from the epic Mahabharata. According to this legend, Barbareek was the grandson of Ghatotgacha, who was the son of Bhima. Barbareek was a brave warrior and had learnt the art of warfare from his mother from the childhood. He had impressed Lord Shiva and had earned three never-failing arrows (teen baan) as a boon and a bow from Lord Agni, with the help of which he would never lose in any battle. The war of Kurukshetra was inevitable and Barbareek was keen to see and if possible participate in the war. He sought permission from his mother to go to Kurukshetra. While leaving he asked his mother that if required then which side should he join and his mother is supposed to have told him to join the weaker side. On his way to Kurukshetra, he is supposed to have met Lord Krishna who recognized him and decided to test his capabilities. Krishna disguised himself as a Brahmin and made fun of him that he was going to a great battle with just three arrows. Barbareek said that for any battle just one arrow was enough which would return to his quiver after achieving the objective. He went on to explain that the first arrow was to mark all that needed to be destroyed, the second was to mark all that needed to be saved and on releasing the third, it would destroy all that had been marked to be destroyed and the same would then return to his quiver. Krishna was keen to see this and so he challenged him to prove it by tying all the leaves of the peepul tree under which they were standing. Barbareek accepted the challenge and shot one arrow with the specific instructions to tie all the leaves of the tree. What he had not seen was that Krishna had plucked one leaf from the tree and hidden it under his foot. The arrow immediately tied all the leaves of the tree and then hovered around the foot of Krishna to seek out the leaf under his foot. Seeing this Barbareek said that there could be a leaf under his foot and if he did not lift his foot, then the arrow would have to mark his foot itself. The infallible nature of the arrows worries Krishna, since even if the targets were hidden far from human sight, the arrow would still seek out the targets and destroy them. During the war, if he wanted to save the Pandavas, Barbareek’s arrows could still seek them out and kill them, if such scenario did arise. Krishna then asked him as to who would be support in the war of Kurukshetra. Barbareek mentioned that according to his mother’s instructions he would join the weaker side and in the war of Kurukshetra and since it was well known that the army of the Kauravas was much larger than that of the Pandavas, he would join the Pandavas. Krishna then probes him further and asks him that what would be the consequence of such act. Barbareek mentions that obviously the Pandavas would win. 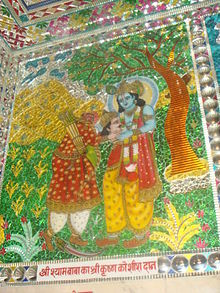 Krishna then goes on explain him the actual consequence of his word given to him mother. The moment he decided to join the Pandavas, the Kauravas would become the weaker side since he could never be defeated. If he then decided to support the Kauravas, then the Pandavas would become the weaker side and this way, all would be destroyed leaving just him. This leaves Barbareek in a state of dilemma. So he asked the Brahmin to help him. Krishna then said that would he do some charity as required by him as a Brahmin which Barbareek agreed. Krishna then said that a before every battle, they had to sacrifice a brave warrior to Ma Kali and according to him, he was the bravest of all Kshatriyas alive, so he needed his head. This left Barbareek in a state of shock and he soon realized that the Brahmin was no ordinary Brahmin, so he asked him to disclose who he was. Krishna appeared to him in his form and Barbareek soon understood it all. As a true Kshatriya, he agreed to keep his word and offered himself to be sacrificed, but he did have a condition. The condition was that he had left his home with a singular desire to witness the epic battle, so could Lord Krishna use some of his divinity to grant him that ability. So it is said that after the sacrifice, Barbareek’s head was installed atop a hilltop from where he witnessed the entire battle and thus he is also referred to as ‘Barbareek – the silent witness’. After the battle of Kurukshetra, it is said that the head was immersed in the nearby river by Lord Krishna and blessed him that in the times of Kaliyuga, he would be referred by his own name – thus Barbareek is referred to as Shyam Baba. Later during the advent of Kaliyuga, the head was found buried in the village of Khatu, in present day Rajasthan. It is said that once a cow reached the spot where the head was buried and soon, her udders started oozing milk all by itself. When the villagers dug the place, they found the head there. 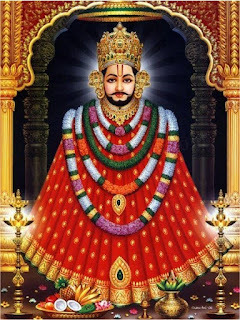 Later a temple was build there, and from then onwards he is referred to as Khatu Shyam Baba. In the present times, there stands a beautiful marble temple in Khatu and many smaller shrines have come up in the entire Northern parts of the country. In the main temple, the idol is just a head and nothing else. People have a lot of faith in his ability to heal or solve problems and the deity has a huge following, something similar to that of Shirdi Sai Baba in the Western parts of country. 1. The myth signifies the prevalence of human sacrifice and the belief in it. Krishna asking for the sacrifice also lends credence to the fact that this was an accepted norm and there was no qualm about it. The myth might have also been added to make a hero of a brave warrior who might have been an unknown soldier who willingly (or even unwillingly) agreed to be sacrificed. 2. Another aspect is the nature of the arrow. The ability to identify the target and return to its source sounds very similar to the modern day missiles which are meant to identify programed targets. I am not implying that the people of the times had the knowhow of such weapons, but this myth is testimony to the fact that such weapons had been thought about then, however fantastic it seems today. Finally before I conclude, please note that this myth is from the Northern parts of India. A similar myth is available in the South India too. But before we touch on that myth, there are some small bits w.r.t. the myth of Barbareek. We will touch upon them next. Yesterday we read about the devotion of Kannappa Nayanar. Another myth which gives an example of appeasing Lord Shiva with devotion is the myth of Kirti-mukha from the Linga Purana. Many of us would have noticed a gory gargoyle like face staring down at us from the walls of temples at the entrance, especially in the South Indian temple architecture. 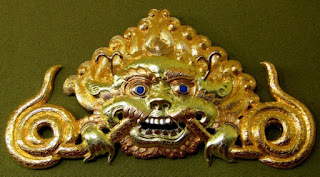 It represents an ugly, but ferocious face with eyes protruding, but still referred to as Kirti-mukha the ‘glorious-face’. In an otherwise ornate entrance, this stands out as a stark blotch. What is it and why is it so placed? According to a myth, there was a ferocious demon by the name of Jalandhara who had wreaked havoc in all the worlds and had evil designs on Parvati, who he thought did not quite deserve Shiva for a husband. 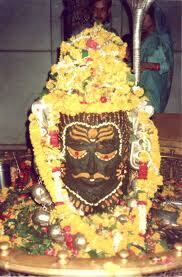 He sent his emissary, Rahu to Shiva to give up claim on Parvati for the sake of the mighty Jalandhara. As soon as Shiva heard the message, he got angry and in his rage a dangerous devouring being emerged from his eyebrows. This being was breathing fire and raging with terror. The sight put fear in the heart of Rahu and he begged Shiva to save him. Seeing this Shiva ordered the being to leave Rahu. But the being was created to devour Rahu and so was hungry and asked Shiva and his hunger had to be satiated and since he was the creator, he needed to resolve the same. Hearing this, Shiva simply said – “Go ahead and eat yourself”. No sooner had Shiva said this, that the being started eating himself starting from his feet, to body and then arms. Just when only the face was left, that Shiva stopped him and was so impressed with his devotion towards his creator, that Shiva blessed him and named him Kirti-mukha or the face of glory and gave it a place of honour on the ramparts of the temple. 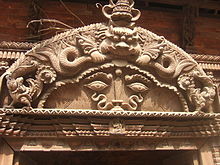 The presence of Kirti-mukha can be interpreted in many different ways. It can be seen as a symbol of utmost devotion, where one does whatever the deity asks one to do, including killing oneself and the face is a reminder of such devotion. Installing it at the entrance is to remind one of the extremity of the devotion and if the one entering into the temple is willing to or capable of touching the extreme. The other possible philosophical interpretation is the presence of un-reigned aggression and passion existing within each one of us and how this raging fire is all all-consuming one. How such fire can be the cause of one’s own destruction should be known to each one of us, who are seeking divine blessings (and help at times). The knowledge is key and the message is that the solution is within us, it’s just that we are not aware of it or have not accepted it hitherto. Many have interpreted this as a reminder to keep ones evil thoughts outside the temple and keep one’s mind clean of such evil thoughts when one is seeking His blessings. This is the most common interpretation and many who do not know the genesis of the mukha could say that. Some even say that this has been a part of an adornment from the Vedic times and the authors of the Linga Purana simply wove a beautiful myth to reason out the odd part of the temple architecture. 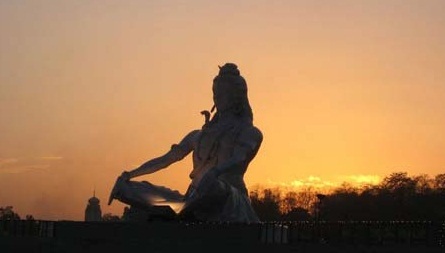 Today is Mahashivratri, the day of Lord Shiva, one of the key members of the Holy Trinity from the Hindu pantheon. There are a number of myths associated with Shiva, but the common thread in all of them is his anger and the easy appeasement of Lord Shiva. Compared to the other gods, the worshipping of Lord Shiva is not very ritualistic and the focus is on devotion. Be it the singular minded focus of Sati or continuous meditation of Parvati or dogged perseverance of Ravana, Shiva is appeased only by devotion and by anybody. There are a number of myths associated with this aspect of Shiva, but I will take up some of the uncommon myths associated with this aspect of Lord Shiva. The first among them is the story from the Periyar Purana, that of Kannappa Nayanar, , who is considered to the epitome of devotion in South India. Kannappa was born in a tribal family and was not well versed with the rituals of worshipping Lord Shiva, but that did not deter him from worshipping a shiva-linga regularly. Since he was a hunter by profession, his hands were always soiled by the blood of his kill, so he carried the water from a nearby river in his mouth and the flowers on his own head to offer to the shiva-linga. Thereafter he would offer the best part of the animal that he would have killed to the shiva-linga. His ignorance of the rituals and the method of the choice of the offerings would upset a local Brahmin who was ritualistic to no end. This went on for some time till the Brahmin sought divine intervention. So one day Lord Shiva asked the Brahmin to hide behind a tree and observe whatever happened the next day. Next day when Kannappa reached the temple, he found blood oozing out of one of the eyes drawn on the shiva-linga. He was very upset and started rubbing herbs that he thought would heal the wound, but this did not help. 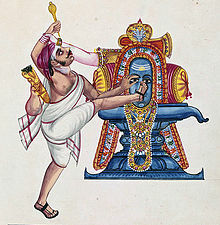 Kannappa immediately took out a knife and cut out his one eye and stuck it on the shiva-linga, and the blood stopped. Kannappa was thrilled and started dancing with joy. But then he noticed that the other eye had now started bleeding. Immediately Kannappa decided to give up his other eye too. But if he did so, he would turn blind and would not know where to stick the other eye. To avoid this, he put his toe on the spot of the bleeding eye on the shiva-linga and cut his other eye too. Seeing this Lord Shiva appeared and blessed him with gave him his eye-sight back and the Brahmin hung his head in shame. This aspect of devotion can be seen as de-ritualizing the worship of Lord Shiva and making the deity more accessible to the common man and in some cases to the outcastes of the society. The people who were not educated, lived in the fringes of the society due to the caste-structure could also worship Lord Shiva, irrespective of the fact that they were meat-eaters or drank alcoholic drinks. Shiva was like one of them. The myth actually makes the Brahmin redundant. The genesis of this myth could lie in the fact that the hegemony of the Brahmin class could have made the gods virtually inaccessible to the common man. The notion that the way to god was through the doors of the Brahmin class only was causing concern to a set of worshippers who did not want to go through the mumbo-jumbo and such feelings could have given rise to such myths. The myth espouses pure devotion, devoid of any rituals. This myth also introduces to a different form of iconography. In many parts of India, faces are drawn on the shiva-linga and the face usually denotes a virile face. 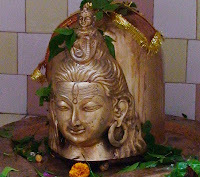 Sometimes there is a face carved on the linga too. This shows that the worshippers were not content with the phallic look of the linga but wanted to associate a more virile and strong appearance on the symbol or rather a form to the formless. Next time we will take another example of extreme devotion…..keep reading. Keep all this and more in mind when you decide on the candidate to vote for. 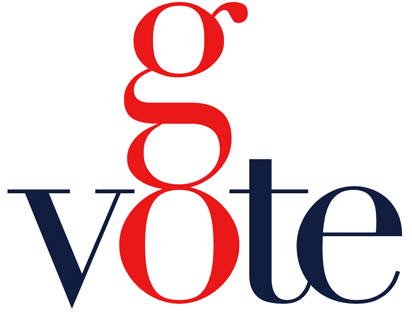 Go out and exercise your prime duty – go and vote. 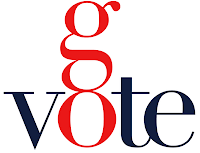 If you want to have your say and if you think you have a right to complain and demand, then first go and vote. According to Times of India, in the year 2007, only 46% of Mumbaikars came out to vote and the result is visible to each one of us. 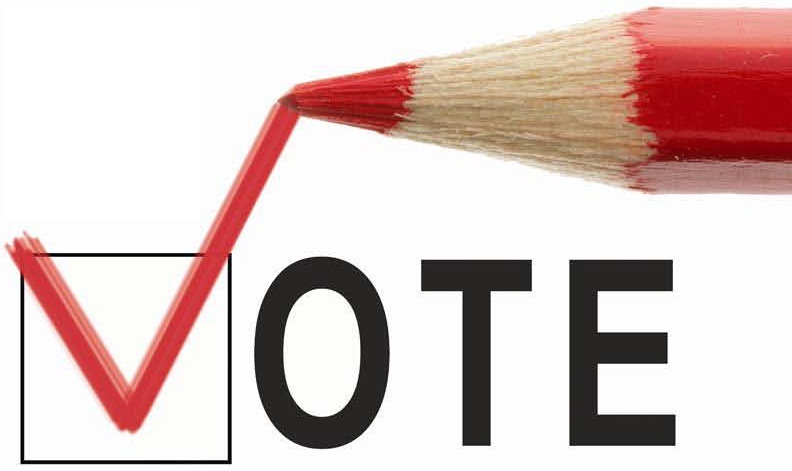 If you do not vote, do not demand – anything………………..anything at all. 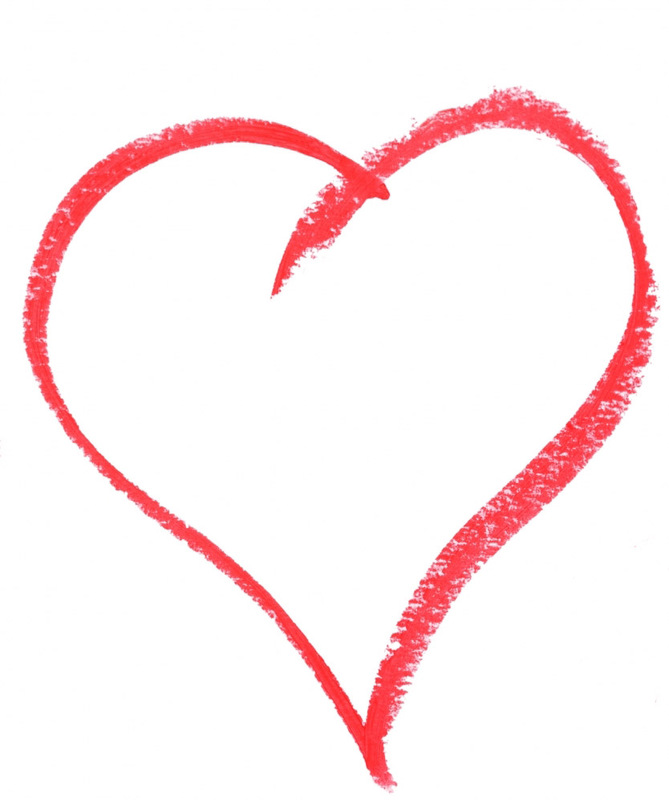 It’s that day of the year when love is in the air – who cares if the day has been made famous by the consumerist economy and is despised by a few who see this as a western import. Love is the most beautiful emotion and let’s not allow a few silly idiots spoil the day, and so, on a day like this, let’s celebrate the concept of love which is in existence from time immemorial and stories of love, can be heard from the time man understood himself (and her!). There are numerous stories of love and the ones that would have caught our fancy is the unfulfilled love and here’s one from the Greek Mythology which is considered to be one of the most well-known love stories. It is the story of Orpheus and Eurydice. There are different versions of this myth, but we will go through the most common of them. Orpheus was a young man who was extremely talented in music. He possessed a divine gift of a lovely voice and had mastered the art of playing the lyre at a very young age. It is said that his mother was one of muse, Muse Calliope. When he sang and played the music, all would stand still to listen to him, be it man or beasts; trees would uproot themselves to come closer to listen to the music, the rivers would change course and the breeze would blow through the music, taking the lovely strains of his music far and wide. Apart from his musical talent Orpheus had an adventurous side to him, but why sour the romantic moments at this moment, so we will skip his adventurous pursuits for the moment! During one such musical rendition, Orpheus noticed a shy wood-nymph, Eurydice and couldn’t help but fall in love with her. It was love at first sight for both of them and nothing could stop them. Soon they were married and after the day long celebrations, it was time to leave the two newly-weds alone. But such are not the ways of love, right? In the shadows was Aristaeus, a shepherd, who secretly loved Eurydice and could not bear the sight of Orpheus and Eurydice holding hands and happily married. He hid in the bushes intending to kill Orpheus when they were passing by. As soon as they came close, he pounced on Orpheus, but Orpheus sensing danger, caught the hand of Eurydice and ran from there. This resulted in a chase, both Orpheus and Eurydice running away from danger that they knew not and Aristaeus pursuing the death of Orpheus. In the wild chase, both Orpheus and Eurydice stumbled on something and before anyone could realize what had happened, Orpheus saw Eurydice being separated from him. In her flight, Eurydice had stepped on a deadly snake that bit her and soon the poison enveloped her and she was dead. Seeing this, Aristaeus fled from there, leaving the inconsolable Orpheus alone with the dead Eurydice. Orpheus could not come to terms with the separation and soon the lovely music had turned soulful. But Orpheus was not giving up. He decided to follow his love to the Underworld. The gates of the Underworld were opened for Orpheus where he sang and played such soulful music that the Hades, the god of the Underworld and Persephone, his queen were moved to tears (Read “Demeter and Persephone” http://utkarshspeak.blogspot.in/2011/03/demeter-persephone.html). So moved was Hades with the sad music of Orpheus that he promised Orpheus to allow him to take Eurydice back with him to the Upper-world. However, while he would take the soul of Eurydice, he should not look back; he should see her only when the soul had crossed the darkness of the Underworld and emerged in the light of the Upper-world. If he did try to see her in the darkness the soul would leave him forever and no power could unite them ever. Orpheus was thrilled, and soon he could feel the presence of Eurydice and he started his journey from the Underworld. He could hear her footsteps and his joy knew no bounds and he wanted to look back and hug her, but was reminded of Hade’s condition. As soon as he reached the gates of the Underworld and could see the rays of the Sun, he could not hold back and turned around. Alas, Eurydice had not emerged out of the dark shadows of the Underworld and all Orpheus caught was a glimpse of her sad face and soon she was gone. The gates closed on Orpheus and this time, he could not cross the gates of the Underworld. The lovers were separated for ever. Orpheus never managed to sing songs of joy and soon started staying away from people and became a recluse. He started staying away from all women as every woman reminded him of his love. The Maenads were the attendants of Dionysus, the god of wine and passion, and they longed for Orpheus. Soon the scorn and neglect got the worse of them and once in a fit of rage, they pounced on him and killed him in rage (some versions say, that he played such sad music calling for death, that all the animals who heard him, killed him weeping all through the act of killing him!). The Maenads threw his body in the river, and it is said that his head and his lyre floated down to the island of Lesvos, where the Muse gave him a decent burial. People in the island believed that music could be heard from his grave, where after death; Orpheus and Eurydice were united in the Underworld, thus ending the saga of love, separation and torment. On this sad note, here’s wishing all a Happy Valentine’s Day.